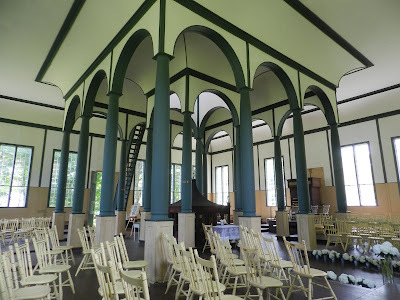 Probably the most fascinating museum I visited during my recent trip to Ontario was the Sharon Temple National Historic Site & Museum located in East Gwillimbury Township, in the Village of Sharon. 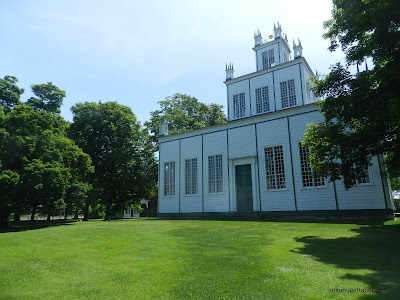 Created by the Children of Peace, a Quaker break-away group who were led by former American, David Willson, the Sharon Temple exemplified the pioneering spirit, ethics, faith, and ingenuity of the people who settled Upper Canada (now known as Ontario). Since it was hard to show everything about the Sharon Temple in one post, I used my day (Aug 5th), on the Heroes, Heroines and History blog to cover Part 1 in this series, Hope in Upper Canada, The Sharon Temple which includes a glass lantern slide, a stereoview, and historic drawings, etc to show how David Willson handed plans for his vision of the temple to master carpenter Ebenezer Doan, another loyalist who had fled to Upper Canada at the beginning of the 19th century. So based on the video it looks like a high-ceiling room with pillars, right? But it's so much more, since David Willson designed it based on both the Old and New Testaments, as fully explained in part 1. For instance, the staircase that's right in the front of the video camera is called the Jacob's Ladder and it's main purpose was to provide a method of getting the musicians and choir members up to the loft, called the Musicians Gallery. But instead of just any staircase, David Willson designed a narrow curving ladder based on his interpretation of Genesis 28:12 where it is written of Jacob: "And he dreamed, and behold a ladder set up on the earth, and the top of it reached to heaven: and behold the angels of God ascending and descending on it." And lest you think the musicians and singers came down backwards, I have to say that I've heard it was quite the event to see them march in the door, around the room, and up the stairs, and then march back down facing the door when the service was over. Honestly, I would have had trouble going up those steps never mind coming down - facing any direction. Along the left side of the temple in the video is the oldest barrel organ in Canada, built in 1820 by Richard Coates as the first of 3 commissioned by the Children of Peace. This 2-barrel organ will be discussed further along with the other temple organs in Part 3 of this series. and now Canada's oldest barrel organ of this size. Beside the organ is a wooden carrier that I assumed was to carry the Ark - the temple's altar which was fashioned after the biblical Ark. I later found out that the carrier is actually the method of carrying coffins in and out during funeral processions. The Ark sits in the centre of the temple, surrounded by pillars. Each of the 12 outer pillars has a plaque with an apostle's name, and each of the inner pillars has a plaque with either Hope, Love, Peace, or Charity written on it. Looking up immediately above the ark, you can see up past the railing of the musicians' gallery, and higher to the uppermost ceiling. The day I explored the Sharon Temple, it was set up for a wedding, hence the white hydrangeas lining the aisle from the west door to the altar. Don't you think there's something serene about the bride and groom signing their marriage certificate while sitting at the lace-covered table in front of the almost 200-year old ark? Like the temple itself, the altar is square signifying the Children of Peace's need of "dealing square with all people". Four doors open into the altar, corresponding to the 4 doors of the temple. Inside, the Bible always lies open to the Ten Commandments. One note of interest concerning the ark is that sometime during the restoration process, the workers discovered a false floor under which was hidden thousands of David Willson's papers including his music and writings, a priceless treasure which is now preserved in the Archives of Ontario. As can be seen in the above photos, the chairs are reproductions of the original hand-hewn ones as shown in the image with the barrel organ. Unfortunately, many ended up in the hands of antique dealers after being sold to Winn’s Theatre of Aurora in 1915 before the museum society bought the temple and began restoration. 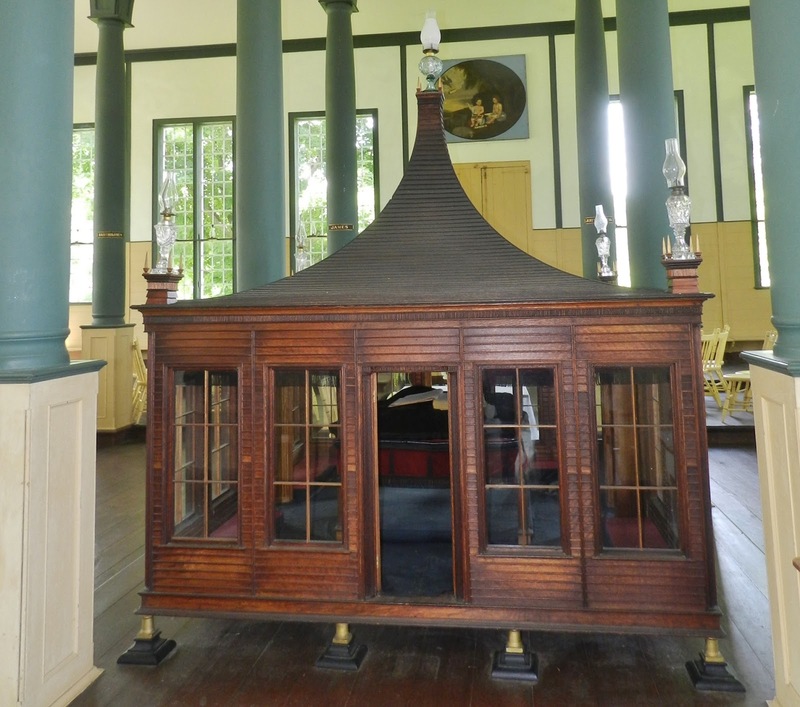 A program is now in place to locate the original temple and meeting house chairs and return them to the temple. If you're interested in a description of what they look like, check out the Sharon Temple Museum Society website which includes a downloadable Temple Chair Form. 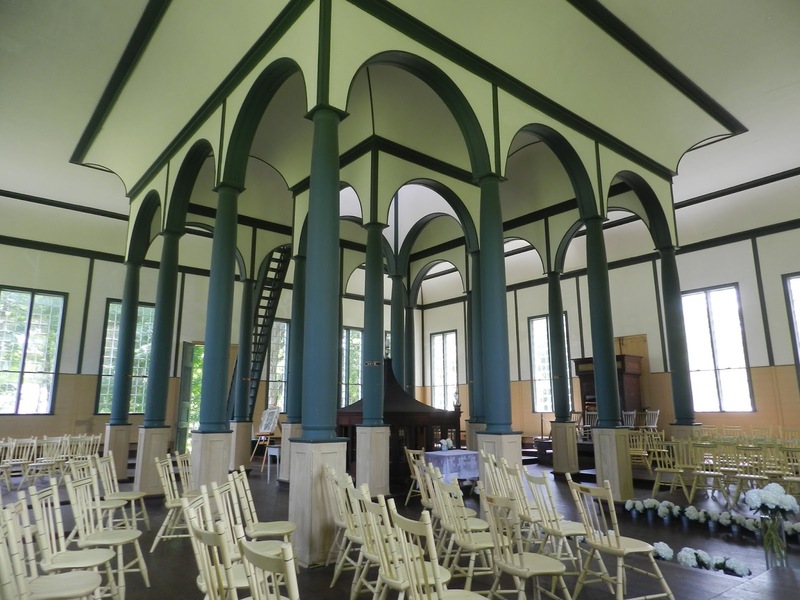 Join me for Part 3 on the Heroes, Heroines and History blog on Sept 5th for a historic look at David Willson's music, the temple organs, the renowned temple band, and a view of the gallery where the musicians sent out their music to reverberate in the wonderful acoustics of the Sharon Temple. While I was on the Sharon Temple Museum site, I noticed one of their ways of raising money was the 'Adopt an Artifact' page. I haven't seen this anywhere else and thought it quite interesting. There is a list of artifacts and the cost to adopt them for one year. Of course, the bigger and more important the artifact, the higher the cost to adopt it. Have you ever heard of this way to raise funds? If you have, care to share who else does it? 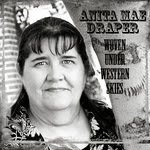 Fun post, Anita Mae! Oh my goodness, those stairs look beautiful, but positively treacherous. I might get up them, but I wouldn't want to come down facing forward! Yikes! Never heard of adopting an artifact, but it's a neat idea. Susie, along with the restoration, the Sharon Temple has brought back the Illumination Service every September, where every candle and lantern in the windows, temple, and spires are lit during the service. One of the blogposts I read about the Illumination Service mentions that one of the female singers said it was easier to go up in the dark when you had to trust that the steps were there, than it was to come down and actually see what you were doing. It reminds me of the story of Peter walking on the water while he looks at Jesus, and then sinking when he looks down at the sea. Wow, Anita. This is amazing. I'm so glad you shared it. That staircase is beautiful. I can imagine how wonderful it would be to see the musicians descend. Thank you for sharing it.